At the last Heart of ATX Reading Salon, women’s fiction writer Kristan Higgins and Texas author Sophie Jordan read from their latest books, both dealing with women coming to terms with who they truly are because, well, we all hit a point when we realize striving for approval is silly and life is meant to be enjoyed. I don’t know about you but I need this sort of reinforcement during the holidays. Throw in a touch of forgiveness and I’m in. Jordan’s Beautiful Sinner hits those points head on. Beautiful Sinner stands alone although it is part of her “Devil’s Rock” series about ex-cons finding their happily ever after. This is an excellent series. Jordan doesn’t pull any punches. Some of these characters are guilty. In this case, Cruz Walsh was not guilty of the high-profile crime he was accused of committing. Now he has been exonerated and finds himself dodging reporters while trying to put his life back into perspective. That is when he runs into Gabrielle Rossi. Back in their high school days, she was known as “Flabby Gabby,” but she has changed in all the right ways. She’s a reporter now who wants Cruz’s story, but being back in her hometown is bringing up all those doubts she had before she left. Why is it so hard to give up the labels that people put on us when we were younger? Beautiful Sinner sizzles. 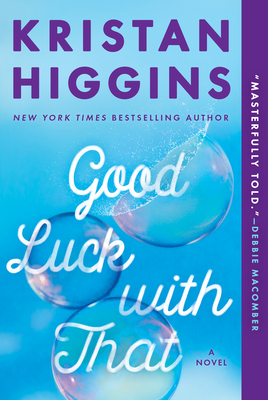 Humor, grace, and those moments when I meet myself head-on in a character’s story are all found in Good Luck with That by Kristan Higgins. She is one of the best contemporary women’s fiction writers on the market today. In Good Luck with That she explores the issues women have with body image and letting others define who we are. So, here is the run down: Emerson, Georgia, and Palmer meet as teenagers as the weight camp their parents sent them to. They made a bucket list of their most earnest dreams which years later a dying Emerson challenges them to fulfill. But can they stop waiting to be perfect and live? This is the book you will urge all of your friends to read so you can have wonderful discussions.